From #BlackLivesMatter to #StandingRock, from#NoBanNoWall to the #InternationalWomensStrike, grassroots movements for human liberation increasingly recognize #Palestinian liberation as a central component of intersectionality. Join some of the leading representatives from these movements to discuss how we can deepen coalition building and a united front within mushrooming resistance in the Trump era. MODERATOR: Garik Ruiz, the North America Liaison for the Palestinian#BDS National Committee (BNC), the largest coalition in Palestinian civil society. He works with local and national partners throughout North America to support BDS campaigns and be a direct link for local organizers back to the BNC leadership in Palestine. 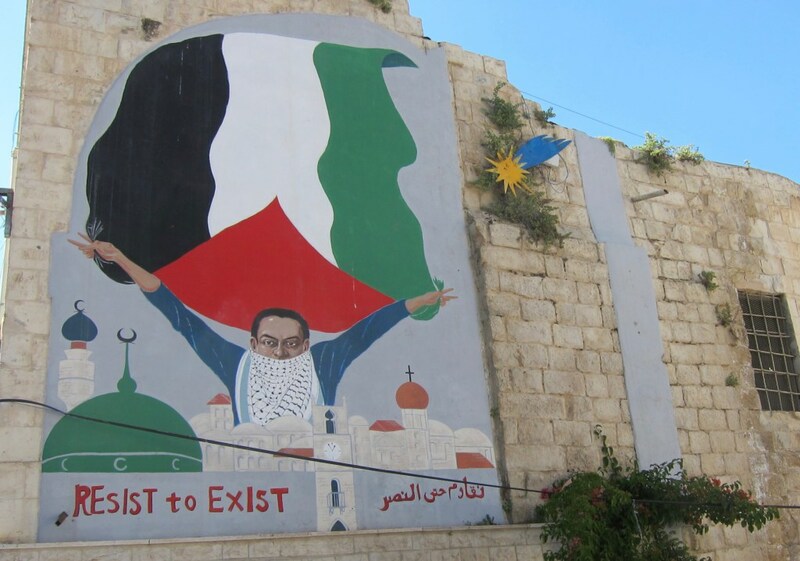 Garik spent 6 months in Palestine at the height of the second Intifada in 2002 and 2003 working with Palestinians resisting the occupation non-violently through the International Solidarity Movement (ISM). LA-based Garik has been deeply involved in local struggles for racial and environmental justice over the years. Amani Al-Hindi Barakat, Palestinian-American community organizer, refugee born in Kuwait, and originally from the village of Tantoura in the suburbs of Haifa. Currently the National Chair of Al-Awda the Palestine Right to Return Coalition, and a board member of the newly launched Palestine Foundation; organizer of many of So-Cal Palestinian Solidarity actions. Alfredo Gama, member Papalotl Brown Berets; undocumented (illegal) youth organizer; organizer of many of the recent large immigration #NoWallNoRaid protests in the Los Angeles area. Robert Gardner, student activist; member of Students for Justice in Palestine (SJP) at UCLA, who has been targeted by ultra rightwing Zionists for his activities; a senior studying Political Science, African American Studies, and Urban Planning. Nana Gyamfi, member and co-founder of Justice Warriors 4 Black Lives, a network of attorneys and non-attorneys dedicated to providing legal support for the Movement for Black Lives, which includes BLMLA; represented all the BLMLA members who were arrested/had court cases/went to trial from 2014 – 2016; will continue to represent BLMLA members who ask for representation. Michael Letwin, NYC public defender; former president, Association of Legal Aid Attorneys/UAW 2325; 1960s-1970s L.A. youth activist (Red Tide); co-founder of New York City Labor Against the War, Labor for Palestine, Jews for Palestinian Right of Return, Labor for Standing Rock. Lydia Ponce, organizer with American Indian Movement-SoCal; Idle No More LA; lead organizer of all the many #NoDAPL protests in LA. Ameena Mirza Qazi, Executive Director of the LA chapter of the National Lawyers Guild. A civil rights attorney and activist; she has worked on free speech, social and economic justice, discrimination, First Amendment, equal protection, and procedural due process issues, including #NoWallNoBan. 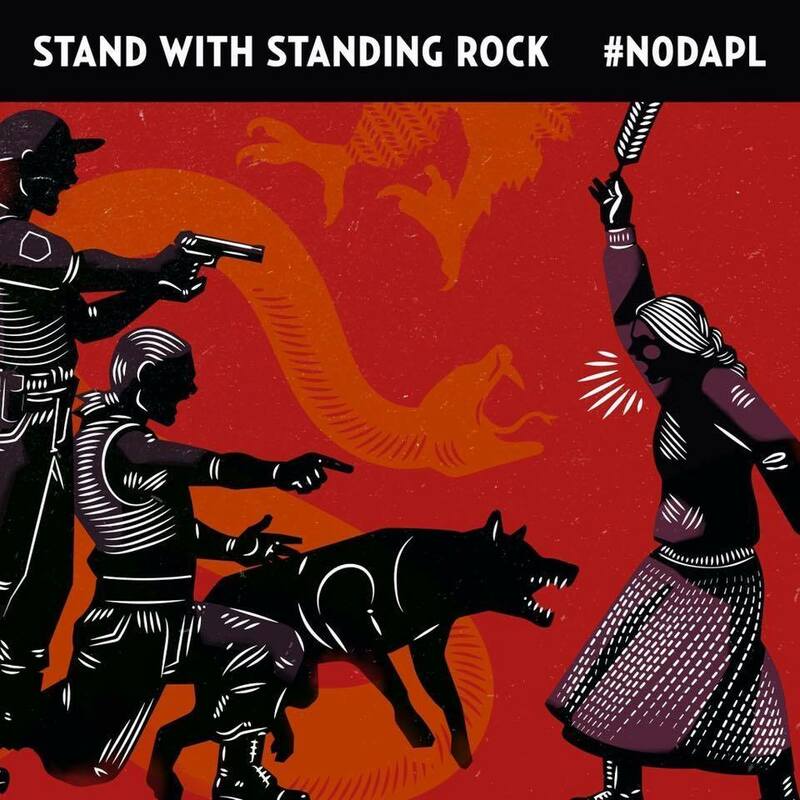 SPONSORING ORGANIZATIONS: Al-Awda the Palestine Right to Return Coalition, American Indian Movement (AIM) So-Cal, California for Progress, Idle No More LA, Jews for Palestinian Right of Return, Labor for Standing Rock and LA4Palestine, March and Rally Los Angeles. Labor for Palestine endorses Labor for Standing Rock mobilization! “We at Oceti Sakowin Camp welcome any and all support from our Union brothers and sisters. This camp stands to protect our sacred water and support a new energy paradigm, jobs and work in green energy fields. We welcome your support in any ways you feel appropriate, join us in paving a new road to a sustainable future for many future generations.” –Message from Standing Rock Council to Labor for Standing Rock, 10/13/26. In response to calls from Standing Rock, please join a coordinated labor mobilization on the weekend of October 29-30! The First Nation’s courageous fight taking place against the Dakota Access Pipeline has ignited a world’s attention. This struggle has become most focused at the water protector’s camp located within the Standing Rock Sioux Reservation. It contrasts an inherently dangerous project of the fossil fuel industry with the protection of the local and global environment, Native American sovereignty, and the necessity of a sustainable world. For our sisters and brothers within the unions and the entire working class, the conflict becomes one of dangerous, fleeting employment that will inevitably destroy our planet, and the possibility of full employment to build safe energy and prosperity for all. With this is mind we recognize that the recent resolution of the AFL-CIO leadership in support of the Dakota Access pipeline is inherently misguided, and in conflict with First Nations, our common environment, and the interests of people worldwide. In addition, the use of force against the people at Standing Rock mirrors the very attacks we have endured through our own history of building our unions. With the future of the environment, the rights of First Nations, and the health of the working class at stake, these subsequent actions will help regenerate a labor movement based on the vision of a just, sustainable, and prosperous world for all. Solidarity Rising: Two More UAW Graduate Employee Units Endorse BDS! 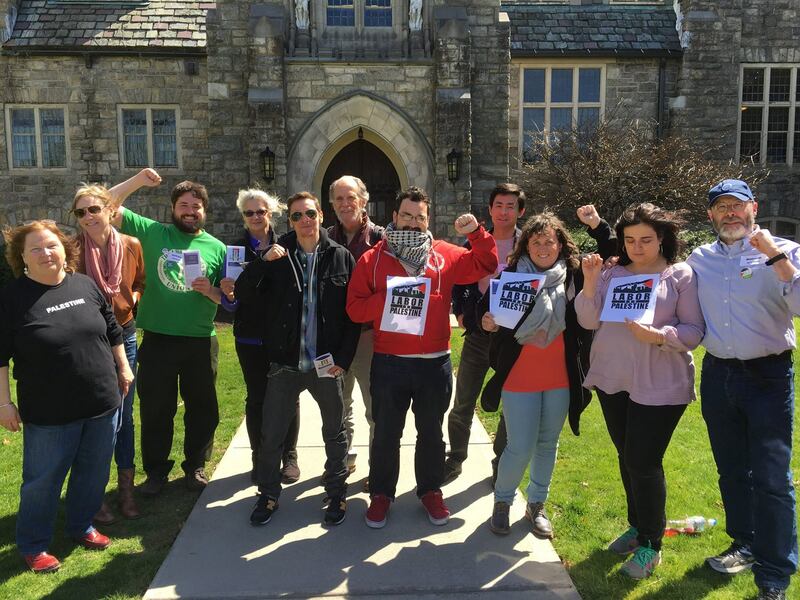 Graduate Employee Units Endorse BDS! This past week the NYU Graduate Employee Union (GSOC-UAW 2110) and the University of Massachusetts, Amherst Graduate Employee Union (GEO-UAW 2322), both representing 2,000 members each, endorsed by full membership vote the call from all major Palestinian trade unions and civil society groups to impose Boycott, Divest, and Sanctions (BDS) against Israel. . . . In December 2014, the 14,000 student-worker union at the University of California (UAW Local 2865) system passed a similar resolution supporting BDS with 65% in favor. 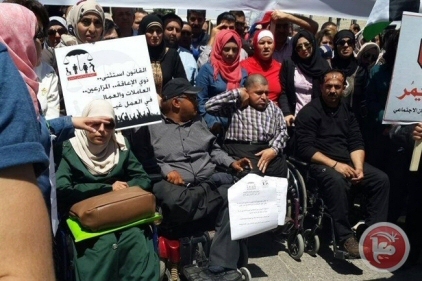 Thousands of Palestinians, on Tuesday, demonstrated outside of a government building, in the occupied West Bank hub of Ramallah, against the Palestinian Authority’s approval of a new law many believe fails to provide adequate protection for workers. . . . Weeks earlier, a teachers’ strike brought the largest public demonstrations against the PA in years. In a new article, British BDS activists Peter Waterman discusses the hypocrisy of Zionist anti-BDS spokesperson Eric Lee, owner of the widely-read website, LabourStart. Recently returned from a ten-day trip to the Israeli-colonized Palestine, a US delegation of anti-prison, labor, and scholar-activists has issued the following statement to mark Palestinian Prisoners Day 2016. The delegation included three former US-held political prisoners, and a formerly incarcerated activist, two former Black Panther Party members, university professors, prison abolition organizers, and trade unionists. This was the first US delegation to Palestine to focus specifically on political imprisonment and solidarity between Palestinian and US prisoners. The delegation also paid special attention to the recent labor organizing in the West Bank and the efforts of Palestinian scholars and activists to reclaim the history, political identity and culture of the Palestinian people. In recognition of International Day of Solidarity with Palestinian Prisoners, the US Anti-Prison, Labor, and Academic Delegation is demanding freedom for the 7,000 Palestinian political prisoners currently held in Israeli jails and all those fighting for justice everywhere, including political prisoners in U.S. prisons. We feel an urgent sense of responsibility to pressure the United States to stop funding Israeli crimes against humanity. We express our support for the struggle for a free Palestine as a central struggle in the worldwide movement against U.S. imperialism. We are committed to employing a variety of tactics in solidarity with Palestine, including Boycott, Divestment and Sanctions, and we condemn Israeli and Zionist attacks against advocates for justice for/in Palestine in our communities and on our campuses. We connect prisoner and labor movements across the borders; and apply the spirit of sumud to all our struggles for liberation within the United States. 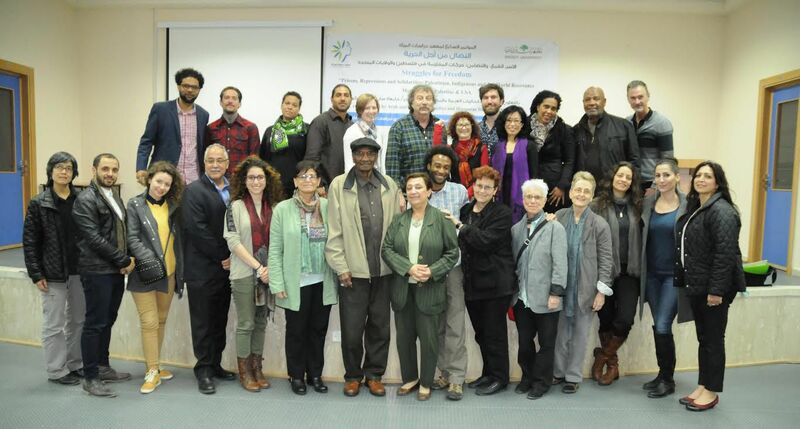 At a moment of growing resistance to state violence and injustice the world over, a delegation of nineteen anti-prison, labor and scholar-activists from the United States traveled to Palestine in March 2016. Our delegation included former U.S.-held political prisoners and social prisoners, former Black Panther Party members, prison abolitionists, trade unionists and university professors. We are the first U.S. delegation to Palestine to focus specifically on political imprisonment and solidarity between Palestinian and U.S. prisoners. Our delegation also focused on recent labor struggles in Palestine for bread and dignity, and on the struggles of Palestinian intellectuals to assert the rightful claims of Indigenous Palestinians to their land, culture and history. On this April 17, the International Day of Solidarity with Palestinian Prisoners, we demand freedom for the 7,000 Palestinian political prisonerscurrently held in Israeli jails and all those fighting for justice everywhere, including political prisoners in U.S. prisons. During our ten-day trip, we heard from diverse groups of Palestinians who daily resist summary executions, mass imprisonment, land confiscation, house demolitions, restrictions to water access and restriction of movement. In the face of Israel’s system of racialized terror, Palestinians uphold their commitment to “sumud.” This Arabic word has historical ties to the Palestinian anti-colonial liberation movement and is defined as “steadfastness,” or standing one’s ground with dignity—a form of resistance. We saw this resistance, and were inspired by it, over and over during our visit. Having witnessed sumud firsthand, we stand in solidarity with the Palestinian anti-colonial struggle and with the liberation of Palestine, including the right to return, the rights of self-determination, justice and peace. We condemn the shocking and continuing human rights violations carried out with impunity by Israel with the full strategic support of the U.S. government. We stand with the growing worldwide movement forBoycott, Divestment and Sanctions (BDS) of Israeli settler colonialism and apartheid. We learned from the Palestinian movement that steadfastness is not only possible but necessary, especially under the most oppressive conditions. Our travels took us to lands colonized by Israel in 1948 and occupied in 1967: from Jericho and the Jordan Valley to the Naqab, Haifa, Yafa, Jerusalem and Nablus; from Ramallah and Bethlehem to Lydd and Nazareth; and from Dheisheh to Ayn Hawd. We met with dozens of former political prisoners, prisoner support organizations and human rights advocates, professors and public intellectuals, political leaders, members of Bedouin and peasant communities threatened with displacement, women leaders, organizers for gender and sexual justice, cultural workers, and trade unionists struggling for dignified work conditions. Our hosts insisted that we examine the harrowing conditions of Palestinian life not just in the context of the Israeli military occupation of the West Bank and Gaza since 1967, but as the consequence of the Zionist invasion and seizure of 1948. The 1948 Nakba, or “catastrophe,” displaced 85% of Palestinians from their lands to the West Bank, Gaza and nearby Arab countries of Jordan, Syria and Lebanon. Subjected to Israeli military rule from 1948 to 1966, Palestinians who remained were internally displaced in their own country, confined to its poorest regions, forbidden from moving freely, stripped of land rights and subjected to a brutal system of racial apartheid. Palestinian residents in territories colonized by Israel in 1948 continue to live with many of the same forms of state terrorism that are commonly associated with the military occupation of the 1967 Palestinian territories—an Orwellian system of laws and regulations including racialized arrest, segregation, settler violence, land confiscation, forced relocation, home demolitions and civil rights violations of all kinds. We witnessed the wholesale project of Zionist colonization—the greatest threat to the life, security and human rights of the Palestinian people. The aim of the Zionist project was—and remains—the creation of an exclusively Jewish state through the violent displacement of Palestinians and their replacement by Jewish immigrants. After 1948, Jews who had been a numeric minority became the majority through the calculated process of massacres, forced expulsion, Jewish immigration from Europe and land confiscations by Zionist settlers. For these reasons, Palestinians we spoke to insisted on framing the roots of current-day problems in the historical context of Israel’s settler-colonial apartheid regime. Time and again, Palestinians made clear the distinction between Zionism as a racist and colonial movement and Jewish people. They emphasized that a free Palestine will be a land of religious pluralism and respect of diverse spiritualities, according to the Palestinian National Charter of 1969 and the 1988 Palestinian Declaration of Independence. Palestinians also stressed that historically and contemporarily there has not been a homogenous stand of Jews on Israel or Zionism. In fact, the intensification of Israeli violence and racism is leading a growing number of Holocaust survivors as well as younger Jews to invoke “never again for anyone” and “not in my name” to dissociate themselves from the Zionist state and its racist and genocidal policies. As strongly as we were compelled to examine the shameful and brutal history of Zionist colonialism in Palestine and the harrowing conditions of Palestinian life, we were in turn compelled to learn about the continuous resistance of the Palestinian people. Time and again, people expressed their commitment to ensuring that Palestine will be free. 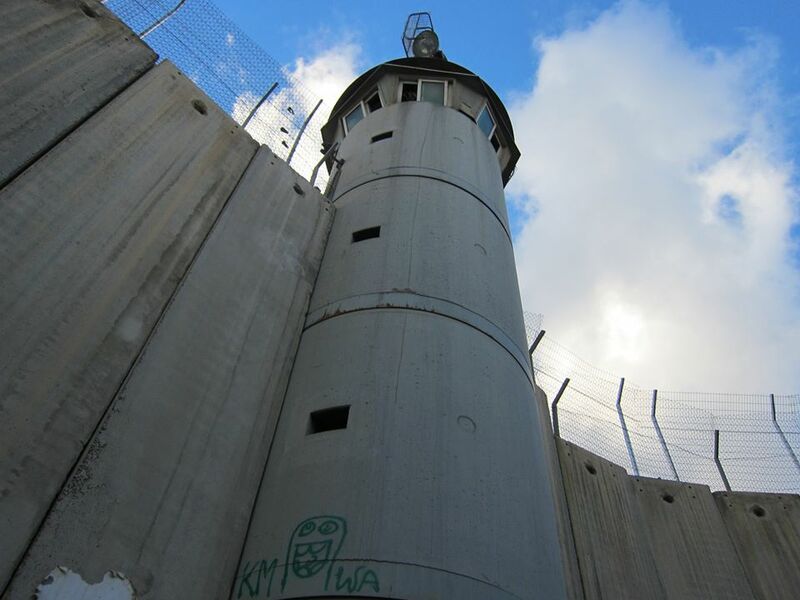 “The Open Air Prison”: Watchtower and apartheid wall, Bethlehem, Palestine. Aware that Israel is the only country in the world that prosecutes children in military courts, our delegation observed the proceedings of three Israeli military tribunals against Palestinian youth. We witnessed a 16-year-old Palestinian boy tried as an adult and accused of running an Israeli over in a vehicle. The boy faced two life sentences in an Israeli adult prison, and was being tried with evidence presented in the form of a video reenactment, constructed from the prosecution’s theory of the act and with details likely coerced through torture, a routine practice of Israeli military prison administrators. More than 99 percent of all cases tried in the military courts end in conviction. The case of child prisoners is particularly harrowing. Human rights lawyers with whom we spoke shared the findings of international reports on the treatment by Israeli courts of Palestinian children, compared to the treatment of Israeli children. Israel’s racist double standard exempts Israeli children from prosecution as adults until the age of 18, while Palestinian children as young as 12 are tried as adults. Often charged with stone throwing, Palestinian children are subjected to lengthy sentences in adult prisons. Legal aid organizations Addameer and Defense for Children International (DCI) informed us that children are often taken from their families in the middle of the night, then handcuffed and blindfolded during their transport to torture sites, where they are denied legal representation or access to their parents for months. A former political prisoner told us that his own experience of torture behind bars was amplified when he heard, in a nearby cell, the voice of a child crying out for his mother. For Palestinians of any age, the price of resisting the colonial apartheid order is often death. Between October 2015 and March 2016, approximately 200 Palestinians, including 41 children, have been extra-judicially murdered at the hands of Israeli military forces. We met Palestinian parents whose homes were demolished and who were levied heavy fines for their children’s alleged actions. In blatant violation of international law and human decency, the Israeli military has refused to release their children’s bodies, which they continue to hold in a state of suspension—literally frozen—for over 6 months. A Palestinian adult we met in the old city of Hebron witnessed and video-recorded, in late March, the execution, by an Israeli military officer, of a wounded and incapacitated youth. This witness was subsequently harassed by settlers and investigated by the Israeli military while we were still in Palestine, a chilling reminder of the repeated arrests in the United States of Ramsey Orta after he recorded the 2014 strangulation of Eric Garner at the hands of the police in Staten Island, New York. Our visit to Palestine made clear that incarceration is a central feature of the ongoing Zionist settler-colonial project. In meetings with former prisoners and legal aid organizations including Adalah, Addameer and the Arab Association for Human Rights, we learned that Palestinians face one of the highest per capita incarceration rates in the world: one in fivePalestinians has been imprisoned at some point in his or her life, including 40 percent of the Palestinian male population. Since 1967, Israel has imprisoned approximately 800,000 Palestinian political prisoners. As in the United States, incarceration imposes collective punishment on communities. The families of the incarcerated in Palestine are forced to travel long journeys of up to 15 hours to visit their loved ones. At the prisons, visitors are routinely subjected to humiliating, full-body searches and sexual harassment by Israeli prison guards, a humiliation that has led some women to discontinue their visits. Once inside, relatives are allowed only a 30- to 45-minute visit: no contact, separated from the prisoner by Plexiglas walls. In the face of repression, Palestinian prisoners have successfully employedhunger strikes to improve prison conditions and win the release of prisoners, including those held under administrative detention–prisoners held without charges, trial, or conviction. Inspired by the Palestinian people’s respect for their political prisoners and fallen martyrs—reflected in images on public walls, in moments of silence, in daily conversations—our delegation is even more committed to making known the existence of dozens of U.S. political prisoners. Many U.S. political prisoners were given draconian sentences for their political activism in the anti-imperialist struggles and liberation movements of racially oppressed groups during the 1960s and 1970s. Dispensing with them as “criminals,” the U.S. government refuses to acknowledge the political nature of their incarceration. Our delegation builds on the long history of solidarity between anti-colonial and anti-imperialist movements in the United States and Palestine, expressed most recently in 2013 when thousands of prisoners in Pelican Bay, Guantanamo and Palestine, all on hunger strike at the time, issued solidarity statements with one another. The presence and the histories of two former Black Panther Party members on our delegation served as a constant reminder of the years of solidarity between the Black liberation movement and Palestine. Israel, which presents itself to the world as a nation of laws, views civil society organizers who bring attention to its crimes as a threat. We were reminded during our visit to the offices of DCI that one of theorganization’s lead coordinators was shot and killed, execution-style, by an Israeli military sniper, as he observed a Palestinian protest against the 2014 Israeli assault on Gaza. We witnessed firsthand the escalating Israeli terror against the Palestinian people when we heard on the news—and discussed with the Boycott National Committee—the calls by Israeli Ministers for the “civic” assassination of BDS leaders. This is an escalation of state-sanctioned terror that includes the 2014 assault on Gaza; the burning alive of Palestinian youth Mohammad Abu Khdair at the hands of settlers; the burning alive of the Dawabsheh family in Duma Village by settlers; and the intensification of detentions, land confiscation, displacement and deportations. These conditions have driven Palestinian youth to take matters into their own hands and engage in acts of resistance, which many call a third intifada. Reacting to this resistance, Israel has used the uprisings as pretext for intensifying violence against Palestinian youth. During our visit, we heard the same message from a cross section of organized forces: that the 1993 Oslo Accords have 1) legitimized continued state violence and re-created a colonial structure—camouflaged as a model of Palestinian autonomy; and 2) weakened the Palestinian anti-colonial liberation movement. Twenty-three years after the failure of Oslo, social, cultural and grassroots organizations, as well as representatives of a wide array of Palestinian political parties, including those of the mass institutions of the Palestine Liberation Organization, emphasized the need to end political divisions in order to rebuild the movement to free Palestine. While we focused primarily on the experiences of those held in official prisons, our visits to cities in lands taken by the Zionists in both 1967 and 1948 made clear that—as in the Gaza Strip, where nearly two million people are currently held under siege—much of post-Nakba Palestine is tantamount to an open-air prison. In cities like Jerusalem (Al-Quds), Lydd and Hebron (Al-Khalil), Palestinians encounter checkpoints, omnipresent surveillance, with watchtowers on virtually every corner, a wall choking off the daily life of Palestinians, racial apartheid and vulnerability to extrajudicial execution on a daily basis. The old city of Al-Khalil is the epitome of an open-air prison. How else can one describe a situation in which children must walk through barbed wire-lined streets with soldiers training machine guns on them from watchtowers—or in which the Indigenous residents of that city have been forced to erect mesh screens over their marketplace to protect themselves from the trash, urine and feces that Zionist settlers throw at them from the windows of their stolen apartments above? We were equally mortified to see that a section of the Israeli apartheid wall has literally cut this historic Palestinian neighborhood in half. Consequently, family members in Al-Khalil are now unable to see one another without going through a military checkpoint. Severe travel restrictions and street closures have turned the formerly vibrant marketplace into a ghost town, as people are unable to travel to the market or even have access to their own homes. 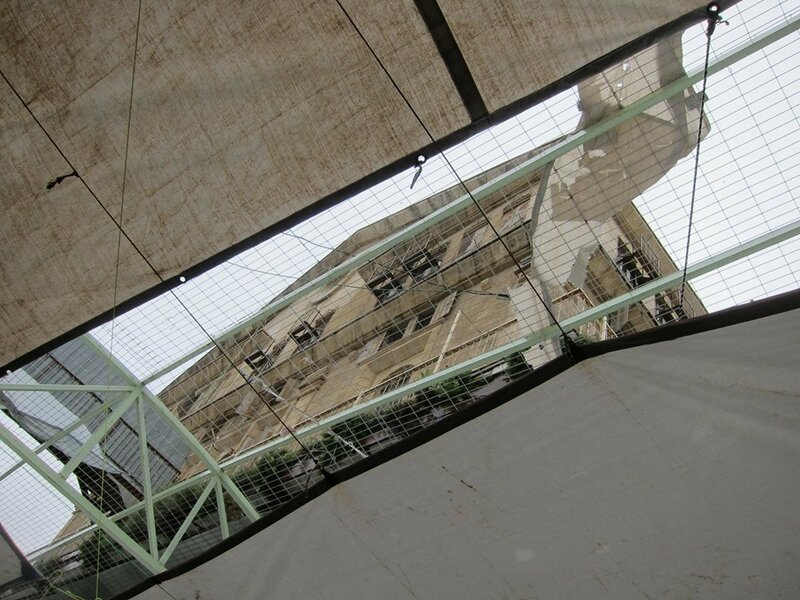 View from Al-Khalil (Hebron) marketplace up to Zionist settlers’ stolen apartments. The tarps have been erected by the Palestinians to protect themselves from the trash, urine, and feces that settlers throw down at them from their windows. Settler colonialism in Palestine aims at the destruction of Palestinian life through a complex colonial network that includes refugee camps, the siege and blockade of Gaza, imprisonment and exile, and the caging of communities on all sides by the “Israeli West Bank barrier”—more realistically, the apartheid wall—that snakes 280 miles through the occupied West Bank and confiscates Palestinian residential and agricultural lands in its path. This attempt at destroying the social and economic fabric of the Indigenous population is the modus operandi of a Zionist state whose goal is to maintain a demographic Jewish majority. The exploitation of Palestinian labor is part and parcel of the ongoing colonization project. Palestinian trade unionists detailed this exploitation to our delegation historically and contemporarily. They explained that the Histadrut—the Israeli labor federation that enjoys a fraternal relationship with the AFL-CIO—has been an integral part of the Zionist movement and the colonization of Palestine even before the creation of the state of Israel. The Histadrut exploits Palestinian workers in Israel by deducting a portion of their salaries for benefits they never receive. Palestinian labor leaders also shared the findings of a draft report on the horrifying conditions of Palestinian women workers, including those who are employed in Israeli settlements on the West Bank and are subjected to long work hours, reduced pay, and sexual harassment at checkpoints. None of the Palestinian workers employed by Israeli businesses enjoy the protection of the Israeli labor federation or Israeli labor laws. Palestinian trade unionists called on us to wage a campaign among U.S. trade unionists to divest U.S. workers’ pension funds from Israeli bonds. Palestinian trade unionists also told us about the devastating socio-economic conditions that have been steadily worsening since the signing of the 1993 Oslo Accords. Oslo legislated and legitimized the increasing dependency of the Palestinian colonized economy on the Israeli colonizing power, and has threatened any potential for the emergence of an independent Palestinian economy. The continuing blockade of Gaza and the restrictions placed on Palestinian farmers and small industries have strangled the Palestinian economy and led to the degradation of living conditions, leading to alarming levels of poverty in the 1967 occupied Palestinian areas, as well as among Palestinians in the areas seized by Israel in 1948. Palestinian labor organizers told us about the crisis in Palestinian refugee camps produced by cuts in the services of the United Nations Relief and Work Agency for Palestine Refugees (UNRWA). Cuts in UNRWA services in education and health, combined with institutionalized discrimination in healthcare, education and employment, have created shocking disparities. Life expectancy for Palestinians is, on average, 10 years lower than the Israeli rate; infant deaths are 18.8 compared to 3.7 per 1000 births; and the death of Palestinian mothers due to complications of pregnancy or labor is 28 per 100,000 births compared to 7 for Israelis. These conditions have led to widespread strikes by Palestinian employees who demand equitable pay scale and the restoration of health and education services. Palestinian trade union leaders also expressed grave concerns over the diminishing conditions of public education in Palestinian Authority areas. They echoed the sentiments of Palestinian teachers, administrators and parents who protested the worsening work conditions for Palestinian teachers and insisted on joining local and national marches for a whole month, despite attempts by Palestinian security forces to suppress their rallies. Trade union leaders also highlighted the apartheid conditions in Israel, where schools are segregated. The ratio of spending on education in these schools is 1:9, and Palestinian students living in Israel are forced to learn a curriculum that denies their own history and exalts the misleading history of the colonizers. We join hands with our comrades in the Palestinian labor movement and salute the struggle of striking teachers, labor organizers and workers demanding economic justice, independence and national self-determination from colonial structures. We further pledge to campaign in the ranks of U.S. labor to divest from Israeli bonds and sever ties between the AFL-CIO and the Histadrut. A university professor with whom we met explained how the system of Zionist colonization is one of the most intensely territorialized systems of spatial control the world has seen. In 1948, Israel destroyed at least 531 Palestinian towns and villages, and within five years, established 370 new Jewish settlement towns, 95% of which were built on seized Palestinian land. The state of Israel now controls 93% of the land captured in 1948. Today, eight million Palestinian refugees are forbidden from returning to their homeland. Those in the West Bank are subject to the ubiquitous system of checkpoints that severely restrict their ability to travel to work, school, mosques and churches, and to hospitals for medical treatment. Under the Absentee Property Law, Palestinians can lose their rights as homeowners for any number of reasons, including renovating or expanding their homes to accommodate a growing family. The Israeli state rarely grants Palestinians permission to build or expand homes, forcing them into “illegal” construction of houses, which are then subject to demolition orders. In the village of Ayn Hawd, near Haifa, an elder explained how Israel confiscated the homes of the Palestinians and turned the village into a park and an artists’ colony, replaced the mosque with a restaurant, and protected the settlement of Zionists living in stolen Palestinian homes. We saw how those settlers have repeatedly trashed and destroyed the old Palestinian cemetery. There, as elsewhere, we witnessed the central role of the Jewish National Fund (JNF) in the ongoing destruction of Palestine. The sight of bulldozers on top of a hill signaled the looming destruction of the village of Um El Heran in the Al-Naqab desert, a territory colonized in 1948. Um El Heran is one of 46 “unrecognized villages” that do not exist on Israeli official government maps and are therefore denied electricity, water, roads, schools and all essential services extended by the state to nearby “recognized” Israeli towns of Jewish settlers. Throughout Palestine, we observed water tanks and solar panels fastened to rooftops to compensate for Israeli restriction of water and electricity, while the homes of Jewish settlers enjoy full state-sponsored services including swimming pools. Bulldozers set to demolish Palestinian Bedouin village of Um El Heran, Al-Naqab desert. 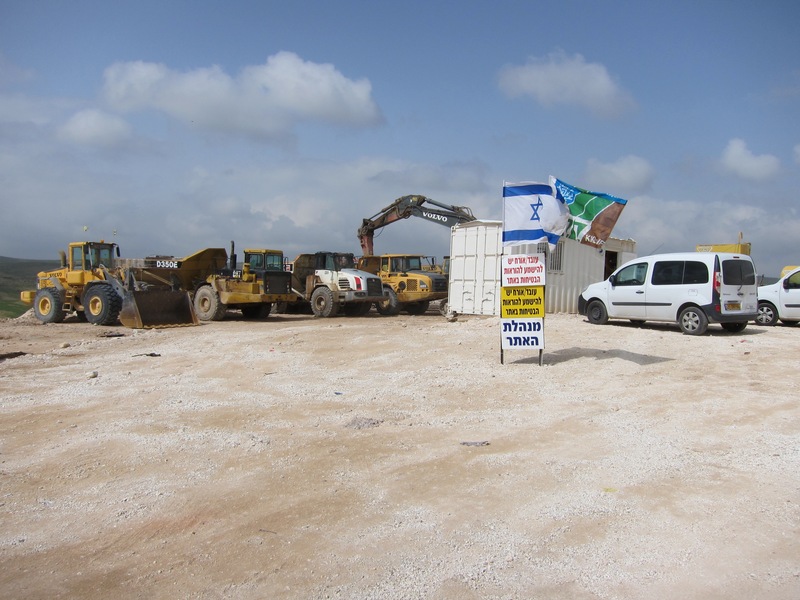 The village is to be destroyed in preparation for the construction of a Zionist settlement. The Jewish National Fund (JNF) flag flies alongside the Israeli flag. Everywhere we went in Palestine we witnessed signs of a culture of resistance. Youth activists in the Naqab told us about their use of poetry to resist Zionist attempts to uproot them from their lands. In the 1948 urban areas of Yafa, Lydd, Haifa and Nazareth we heard about oral history projects to counter the systematic program of cultural and historical erasure deployed by Israel through the outright destruction of sites and signs of Palestinian life, their replacement with invented maps and road signs, and the elimination of the word “Palestinian” from school textbooks and curricula. We also heard from grassroots organizations and activists about campaigns to defy Israel’s ban on the commemoration of the Nakba, about projects, that bring Palestinian children to the sites of their families’ destroyed villages, and about others that use oral history to pass on the collective memories of a people who refuse to submit to a settler-colonial project aimed at negating their existence on their land. We visited the Ibdaa Arts Center in the Dheisheh refugee camp and the Popular Arts Center in El Bireh and saw, painted on interior walls, murals that defied the Israeli occupation ban on resistance art on public walls. Palestinian cultural figures told us that Israel continues to shut down theater, dance and music performances that challenge its colonial rule. We learned that, in an attempt to end the wave of protests currently engulfing Palestine, the Israeli Prime Minister demanded that the Palestinian Authority prohibit taxi drivers from playing Palestinian music on their radios. 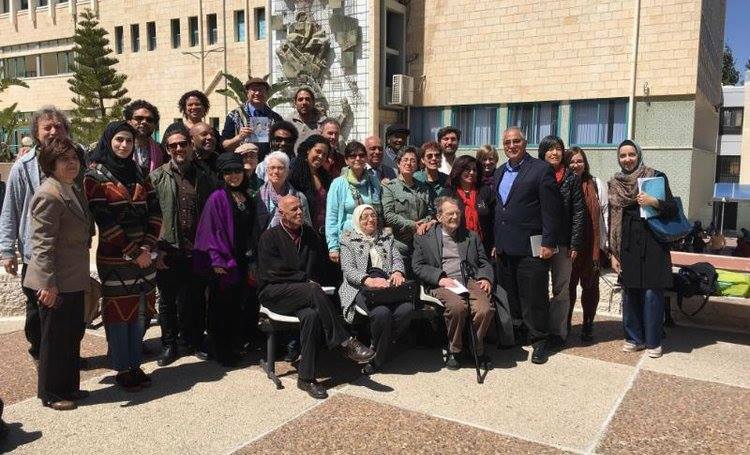 We participated in two conferences hosted by the Institute for Women’s Studies at Birzeit University and the An-Najah National University, both co-sponsored with the Arab and Muslim Ethnicities and Diasporas Studies at San Francisco State University. We shared the platform with Palestinian academics who are engaged in the daily struggles of their people and who insisted on defining the academy as a site of struggle for the dignity of all Palestinians. We compared our respective analysis of the United States and Israel as settler-colonial regimes intent on destroying Indigenous life and the Third World movements that have arisen to challenge colonialism and imperialism. Solidarity was forged as former political prisoners in Palestine and former US-held political prisoners in our delegation discussed parallel experiences. Palestinian audiences at both conferences were moved by the messages we brought with us in a collection of letters from currently incarcerated U.S. political prisoners—some of whom have already served 40 years and more—to their Palestinian sisters and brothers. Our colleagues at Birzeit University’s Institute for Women’s Studies translated the letters into Arabic. The solidarity was palpable during the final plenary of Birzeit’s conference, when the phone rang and we heard the voice of U.S. political prisoner Mumia Abu Jamal. Mumia was calling from State Correctional Institution Mahanoy in Pennsylvania to express solidarity with and love for the people of Palestine. We learned that Palestinian universities offer free tuition to former Palestinian prisoners and that every graduation ceremony honors Palestinian students, faculty and staff martyred or imprisoned by Israel during the academic year. In contrast, Israel has banned access to education for Palestinian prisoners, even denying some the possession of a pencil and paper. Speaking alongside members of both campus communities who were imprisoned by the Israeli colonial state, and witnessing how Palestinian universities honor those who sacrificed their lives for their people heightened our commitment to insist that our own academic institutions resist the neoliberal university, reclaim the mission of public education, and restore the gains for which earlier generations of students—including the Student Nonviolent Coordinating Committee; Black Student Unions; the Third World Liberation Front at San Francisco State University; Ocean Hill-Brownsville; the Open Admission Strike of 1969 at the City University of New York—fought. This struggle continues today on our campuses and community spaces. We also reject Israel’s and the Zionist movement’s attempts to employ McCarthyite tactics to intimidate, harass and silence advocates for justice in and outside Palestine, and activists and scholars who stand for justice on university campuses, public schools and in public life the world over. We were asked repeatedly to bring these Palestinian stories of dispossession and steadfast resistance back to the United States. Much of what we saw in Palestine called up images of life in the United States. Like Israel, the United States is a settler colony—built on the genocide and denial of Indigenous peoples’ rights; the kidnapping and enslavement of Africans; the colonization of Mexico, Puerto Rico, the Philippines, Hawaii and Guam; the exclusion of Chinese people; the incarceration of Japanese people in concentration camps; and the rising vilification and criminalization of immigrants from Latin America and of Arabs, Muslims and Mediterranean and South and Central Asian people. Like Israel, the United States suppresses resistance using the cover of law. The United States continues to engage in imperialist wars and interventions in the Third World, while 2.3 million people are incarcerated in U.S. prisons, young Black, Latina/o, and Indigenous people are executed and targeted while educational institutions become increasingly privatized and corporatized. The 99% are getting more impoverished while the 1% is getting richer. Significantly, the United States funds Israel to the tune of $4 billion annually and supports the distorted ideology of Zionism. We therefore feel an urgent sense of responsibility to pressure the United States to stop funding Israeli crimes against humanity. We express our support for the struggle for a free Palestine as a central struggle in the worldwide movement against U.S. imperialism. We are committed to employing a variety of tactics in solidarity with Palestine, including Boycott, Divestment and Sanctions, and we condemn Israeli and Zionist attacks against advocates for justice for/in Palestine in our communities and on our campuses. We connect prisoner and labor movements across the borders; and apply the spirit of sumud to all our struggles for liberation within the United States. Join us for an informative presentation and a collaborative discussion. This workshop will address the US labor movement’s history and future building solidarity with struggles against apartheid, with a special focus on Palestine. Presenters will explore the following questions through education, discussion and skill sharing. Why is this a union issue? How does Israeli apartheid Palestine affect Palestinian workers? How can we respond to Palestinian unions’ calls to Boycott, Divest from, and Sanction Israel? 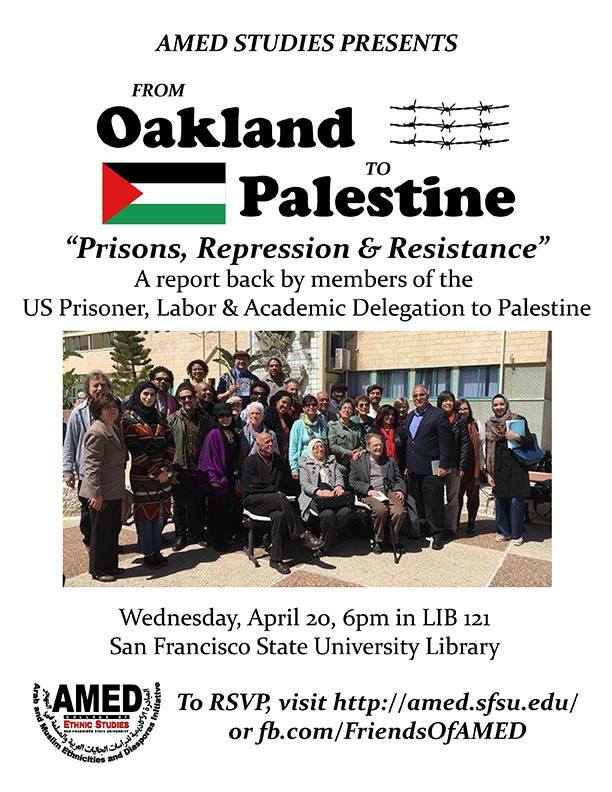 What can we learn from the recent history of labor’s involvement in this struggle, including the ILWU action against the unloading of Israeli ships, and the academic workers of the University of California and the Connecticut AFL-CIO’s voting to endorse BDS. What can we do in our local unions to build solidarity with Palestine? Labor for Palestine at UCLA! 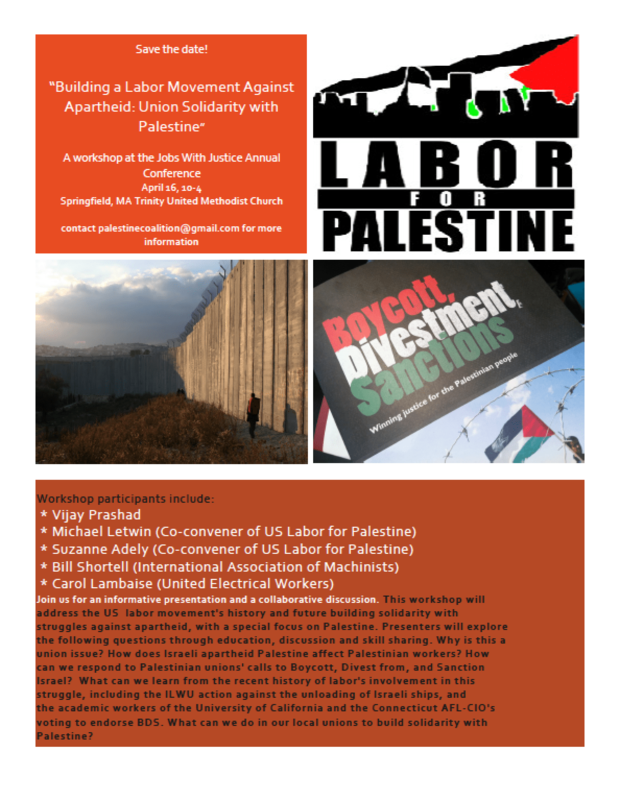 Labor for Palestine co-founder Michael Letwin will speak on the connection between the labor movement and Palestinian human rights. In addition to co-founding Labor for Palestine, Michael is the former President of UAW Local 2325, co-founder of Jews for Palestinian Right of Return, founding member of Block the Boat NYC, member of the Organizing Committee of the US Campaign for the Academic and Cultural Boycott of Israel, and a former UCLA South Africa anti-apartheid student activist. UAW 2865 members are encouraged to attend and learn more about this issue in anticipation of our December 4th union vote on joining the BDS movement! Please join, repost and forward widely! Please also join Block the Boat actions in LA/Long Beach (August 13), Oakland (August 16) and Tacoma/Seattle (August 20). Zionism isn’t welcome on our Coast! Those planning to participate: subscribe to text-alerts and receive live updates about the 8/16 Block the Boat, text “join” to (510) 346-5951. STOP THE SIEGE ON GAZA! END THE COLONIAL OCCUPATION OF PALESTINE! RIGHT OF RETURN FOR ALL PALESTINIAN REFUGEES! The world has watched in horror as Israel has continued to bombard and devastate Gaza. Millions around the globe have come out in support of the Palestinian people and against the Zionist regime, holding massive marches, demonstrations, and actions. Here in the Bay, San Francisco witnessed some of the biggest mobilizations in recent years, with a series of marches, each bringing out thousands of people. It’s time to step it up. Palestine is calling us to action! Palestinians laborers, Palestinian General Federation Trade Union (PGFTU), have called on workers around the world to refuse to handle Israel goods. Palestinians throughout Gaza, the West Bank and 1948 Palestine have demonstrated their unity in the struggle against Apartheid Israel and have taken to the streets in the tens of thousands, bravely facing Israeli military armed with US made weapons to call on the international community to stand with them as they resist Zionism throughout all of historic Palestine. We will be answering this call by organizing community pickets at the Port of Oakland, asking the longshoreman to honor this request and to stand with the people of Palestine as they have done in the past. During apartheid in South Africa, ILWU workers made history when they refused to unload South African cargo in San Francisco in 1984. This action was a major catalyst for international anti-apartheid solidarity and struggle worldwide. In 2010, after a Turkish flotilla, the Mavi Marmara, was attacked by Israel for attempting to bring humanitarian aid to Gaza, we built on ILWU’s history and successfully blocked the Israeli Zim ship from being unloaded at the Port of Oakland – the first time in US history an Israeli ship was blocked. We will be continuing this legacy by organizing to block the Israeli ship once again. And just as apartheid fell in South Africa, so too it will fall in Israel! If there is one thing that the latest Israeli attacks show, it’s the power of Palestinian resilience. The resistance in Gaza is still alive and thriving, despite Israel’s ongoing attempts to destroy it. But we should always remember that the Palestinian resistance did not begin with Israel’s latest bombardment, nor did it begin during the last bombardment. It has been going on since 1948, since Israel came into existence. And it will not cease until Israeli apartheid falls. We refuse to allow Israel to conduct its business as usual, here in the Bay and everywhere! Every Saturday, the Israeli owned Zim shipping line docks and unloads its cargo at the Port of Oakland. Let this action be the beginning of a sustained campaign to stop the Israeli ship from ever unloading in our town. From Seattle to Oakland to Los Angeles – turn the Israeli ship around! We encourage all of our allies on the West Coast to join us in ensuring that Zim ships are not welcome anywhere.